Diem Chau Carves Pencil Tips Into Incredible Miniature Animal Sculptures! Artist Diem Chau wowed us with her expert carving skills that transform Crayola crayons into animal totems—and now the artist has turned to graphite. Her latest tiny sculptures are carved away from the deep silver of old carpenter pencils, revealing perfect sculptures of a bird and an elephant, at minuscule proportions. 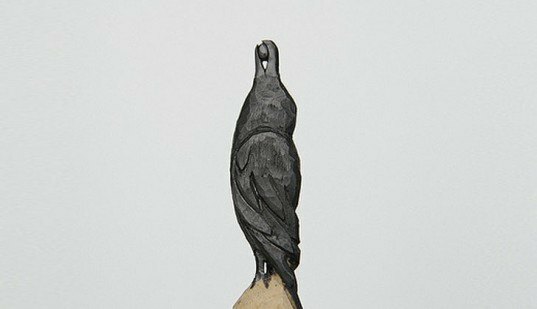 The artist’s striking tell-tale raven emerges from the whittled, rectangular base of the flat carpenter’s pencil. Standing tall and erect on the white painted stub, Diem has carved the raven in a moment of delight, about to devour a succulent berry of some sort. With utmost precision, Diem’s raven is perched on two freestanding legs, with its wings held back in feathery detail. The dark embers of the graphite being the perfect coloring for the iconic bird. 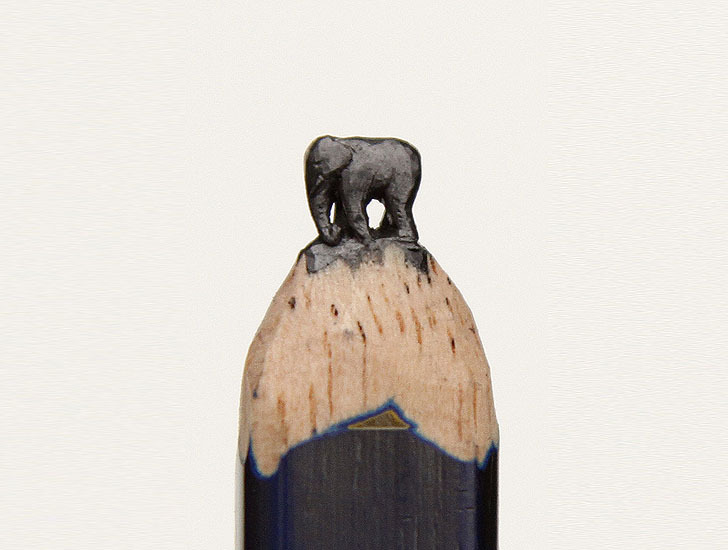 Diem’s microscopic sculptural graphite elephant seems to climb the mounted of the rounded pencil stub, like a fairy tail version of Hannibal’s elephants. The tusked creature is carved mid-walk, with right legs pressing forward, and trunk dragging on the ground with fatigue. The artist gives us a hint of high sun, as the little pachyderm casts a long and deep shadow onto wooden pencil mound, as it trudges across. Diem’s unique creations transform art supplies into works of art in the most literal sense possible. Her animal carvings of crayons and pencils are folkloric, evoking totem poles and allegories, while bringing a sense of wonder with their executed intricacy. So interesting how some only can view the ugly and dark in the world ~ then you have those that see beauty in every small thing. The artist’s striking tell-tale raven emerges from the whittled rectangular base of the flat carpenter’s pencil. Standing tall and erect on the white painted stub, Diem has carved the raven in a moment of delight, about to devour a succulent berry of some sort. With utmost precision, Diem’s raven is perched on two freestanding legs, with its wings held back in feathery detail. The dark embers of the graphite being the perfect coloring for the iconic bird. Diem’s microscopic sculptural graphite elephant seems to climb the mounted of the rounded pencil stub, like a fairy tail version of Hannibal’s elephants. The tusked creature is carved mid-walk, with right legs pressing forward, and trunk dragging on the ground with fatigue. The artist gives us a hint of high sun, as the little pachyderm casts a long and deep shadow onto wooden pencil mound, as it trudges across. Diem’s unique creations transform art supplies into works of art, in the most literal sense possible. Her animal carvings of crayons and pencils are folkloric, evoking totem poles and allegories, while bringing a sense of wonder with their executed intricacy.